Free Shipping Included! LeaningTech 2.4GHz DC12V Wireless 5W Audio Video AV Transmitter Sender Receiver CCTV, 2000 Meter 8 Channels by LEANINGTECH at Home Entertainment Centers Online. MPN: 307529484. Hurry! Limited time offer. Offer valid only while supplies last. * This is an amazing products that connect your equipment, like VCR, DVR, Video camera, AV equipment or satellite system to make it become wireless! * This is an amazing products that connect your equipment, like VCR, DVR, Video camera, AV equipment or satellite system to make it become wireless! You can have 8 of these receivers running in the one location as there are 8 selectable channels. * With this gadget, you can have your video and stereo audio transmitted from one place to another even through walls. You can find a whole bunch of uses with it. 1. Please ensure that the antenna is connected first before energized. 2. If you find out the signal is weak or the picture is moving around in the screen and so on, you can try to switch to another channel. 3. If you have any issues in using this AV Transmitter Sender Receiver, please don't hesitate to contact us, we will provide you with excellent on-line services. * Good microwave anti-interference performance. * Easy operation & installation. * Signals transmitted: Video and Audio. * Hi-efficiency and special antenna. * Body: All metal with metallic paint, rust resistant. * Power source: DC9V/12V 1A. ➤ Effective Range: Up to 2000(1.24 mile) meter line of sight, 80 meter with walls in between. ➤ 8 Channels provided as options to ensure clear reception of video and audio. ➤ Stereo Audio Function: Perfect for using with DVD, camcorder, satellite system or stereo. Wide band characteristics of fine audio and video receive quality. 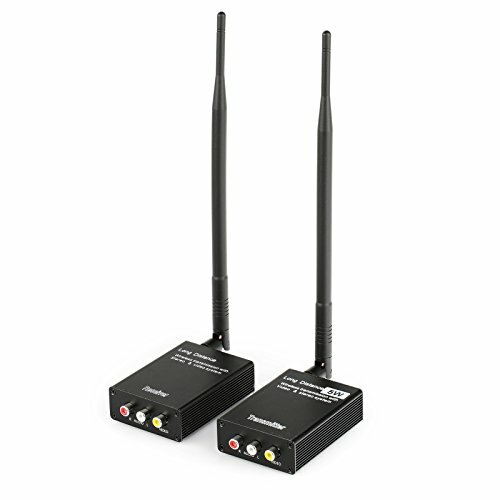 ➤ Wide Compatibility: Transmitter can connect any AV devices such as CCTV camera, VCR Recorder, DVD player, Video camera, etc. Low power consumption, high sensibility. ➤ Input & output: RCA Jack for Video and Audio.